One of the things I talk about in my Guide to Getting Started with Meal Planning is that you should incorporate family favorites into your rotation. We’ve been making these veggie burgers for a few years now, so I definitely think they qualify for “favorite” status! We like to eat meatless meals at least a couple times a week – both for health reasons and to lessen our impact on the planet. I originally got this recipe off Oh She Glows– however she adapted the recipe from another website (Whitewater Cooks) and I ended up combining hers and the original (since I am neither vegan nor gluten-free, if you are vegan or gluten free there are substitutions noted on Oh She Glows) and I think it’s a remix made in heaven! I often make this with oven french fries or sweet potato french fries, and although my kids do not love veggie burgers, they will indulge me if I make them into funny shapes (the snowman on a toothpick is a hit ;-)) plus, it’s the only time we ever eat french fries at home, so they are willing to compromise, ;-). This time I made them with roasted broccoli, which my 8 year old hoovered down and then begged for more. If you don’t like broccoli or your kids don’t – try roasting it! Total game changer! 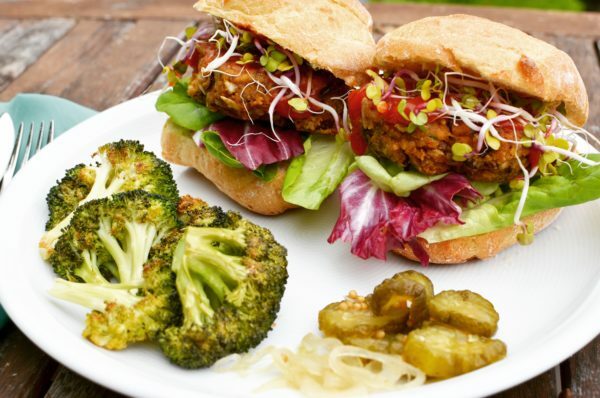 These Delicious Vegetarian Burgers are a family favorite! Thick and chunky, and never mushy, the whole family will love them! Into a large mixing bowl, add the drained beans. With a potato masher, mash the beans until 2/3 of the mixture is a bean "paste" while leaving about 1/3 of the beans mostly intact. In a medium skillet, add the oil and increase the heat to medium. Stir in the onion, garlic, and a pinch of salt. Sauté for 3 to 5 minutes, until the onion softens. Transfer the onion mixture into the bowl with the mashed beans. Stir in the eggs, grated carrots, parsley (or cilantro), sunflower seeds, almonds, soy sauce, chili powder, oregano, and cumin until thoroughly combined. Stir in the coarsely chopped oats, bread crumbs, and flour until the mixture comes together. It should be easy to shape the dough into patties. Stir in the salt and pepper, to taste. Shape the dough into 8 patties (roughly 1/3 cup of dough per patty). Pack the dough together tightly as this will help it stick together. If baking, bake in a 180C/350F oven for 30 minutes, flipping once during cooking. If pan frying, fry on medium-high until both sides are browned and steaming hot in the middle. Serve in a bun with your desired toppings. We like things like cheese, avocado, BBQ sauce, sprouts, red onions, pickles - whatever we have on hand! Leftover burgers will keep in an airtight container in the fridge for 2-3 days, or you can freeze them up to 1 month. Freeze burgers flat then wrap in plastic wrap and then tin foil. Store in a ziplock freezer bag. * To coarsely chop the oats, add 1/2 cup rolled oats into a food processor. Process the oats until a coarse meal forms (the chopped pieces will be a mixture of powder and chopped oats just smaller than rice). Be sure not to process too long or the oats will turn into flour.